So you’re minding your own business when all of a sudden, a nuclear bomb goes off, there’s a shock wave, fires all around, general destruction and you, having somehow survived, need a drink. What can you do? There is no running water, not where you are. But there is a convenience store. It’s been crushed by the shock wave, but there are still bottles of beer, Coke and diet soda intact on the floor. So you wonder: Can I grab one of those beers and gulp it down? Or is it too radioactive? And what about taste? If I drink it, will it taste OK? This could happen, no? Not to everybody, but let’s say it happens to you. Have you been wondering what to do? 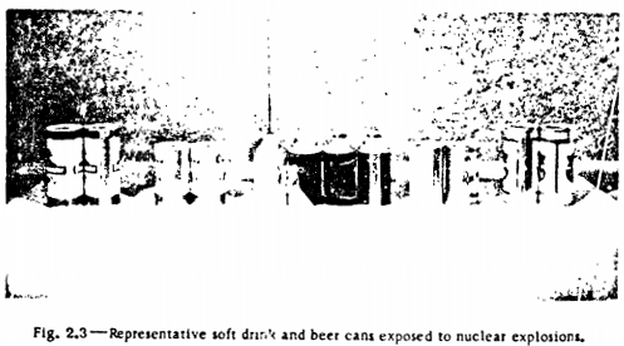 Thanks to my friend, science historian Alex Wellerstein, we are now in possession of a 1957 U.S. government study called “The Effect of Nuclear Explosions on Commercially Packaged Beverages,” which addresses this very question: After the bomb, can I drink the beer? 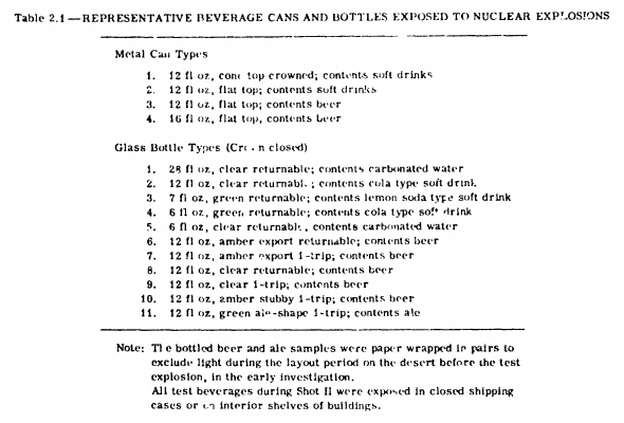 Written by three executives from Can Manufacturers Institute and the Glass Container Manufacturers Institute for the Federal Civil Defense Administration, the study says that after placing cans and bottles of soda and beer next to an actual atomic explosion, after measuring subsequent radioactivity and after actual taste tests, go ahead: Grab that can, pop it open and drink away. If you can make it to the store, you can drink. How do they know this? The closest containers were placed “less than a quarter-mile away,” says Alex, “a mere 1,056 feet,” the outliers a couple of miles off. Some were buried, some left in batches, others were placed side by side. These images, copied from bad photocopies, are in the report. The cans, as you can see, survived. Lots of bottles survived, too. Some were shattered by flying debris, fell off shelves, or got crushed by collapsing materials, but a surprising number stayed intact. 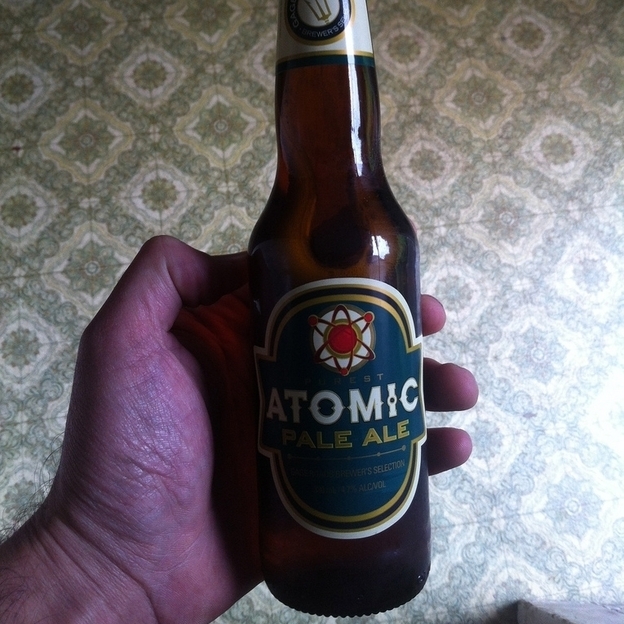 Will the beer be radioactive? But what about taste? Post-bomb beer might not poison you, but will it keep its flavor? 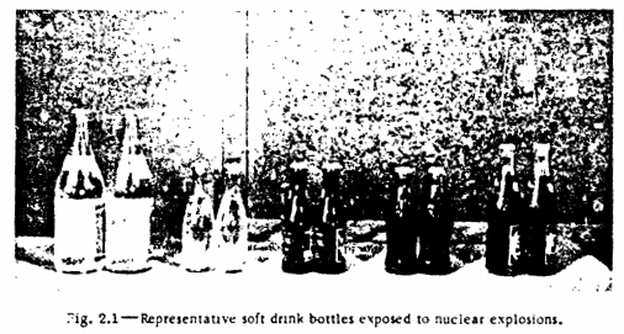 The first tasters then passed samples to selected laboratories for further testing, and this time the contents were rated “acceptable.” So here’s your government’s considered advice: Should you find yourself near an atomic blast and run short of potable water, you can chug a Coke or a beer, but don’t expect it to taste great. There’s a second lesson here, Alex thinks. Because beverages in bottles and cans keep you safely hydrated in dire emergencies, it makes sense to keep a six-pack or two or three (or four), in the basement, just in case. What if there’s no lootable convenience store conveniently close by? If you want to see the government report, you can find it here. Alex Wellerstein’s analysis “Beer and the Apocalypse“ (which I used to write my story) appeared on his blog, Restricted Data. 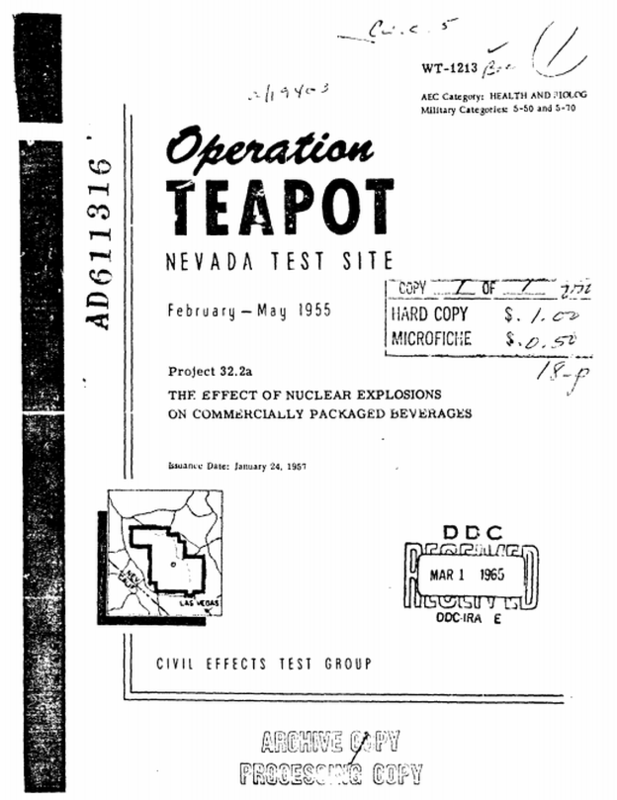 This entry was posted in Year Zero Survival Blog and tagged beer, dirty bomb, dirty bombs, food radiation, long term food storage, MRE, nuclear survival, nuclear testing, radiation, safe food, surviving nuclear fallout by staff-writer. Bookmark the permalink.